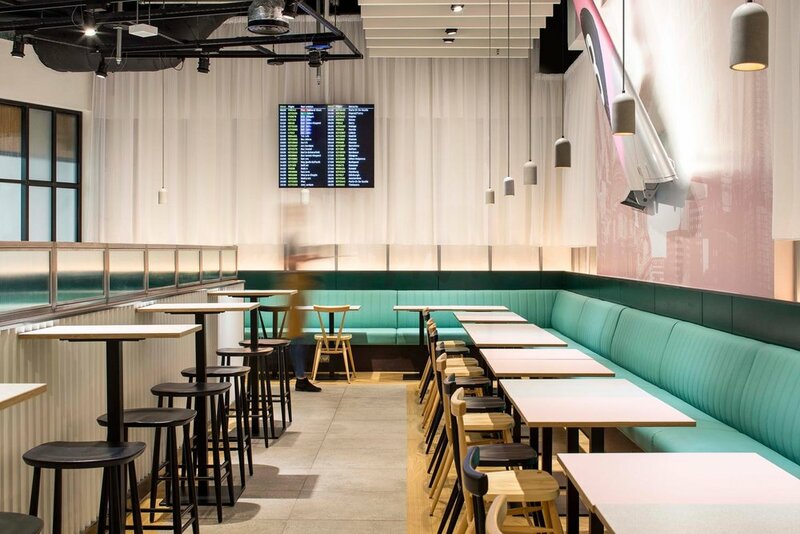 We have completed a new coffee shop and delicatessen for Benugo at London Luton Airport as part of the transformation of the airport’s departure terminal. The brief called for the development of Benugo’s evolving brand with a tailored approach towards their presence within transport hubs. The design aims to conjure the sense of style and comfort associated with the golden age of travel whilst evoking elements from the airport’s current visual language, contrasting high quality materials with the presence of floor markings and exposed structures. 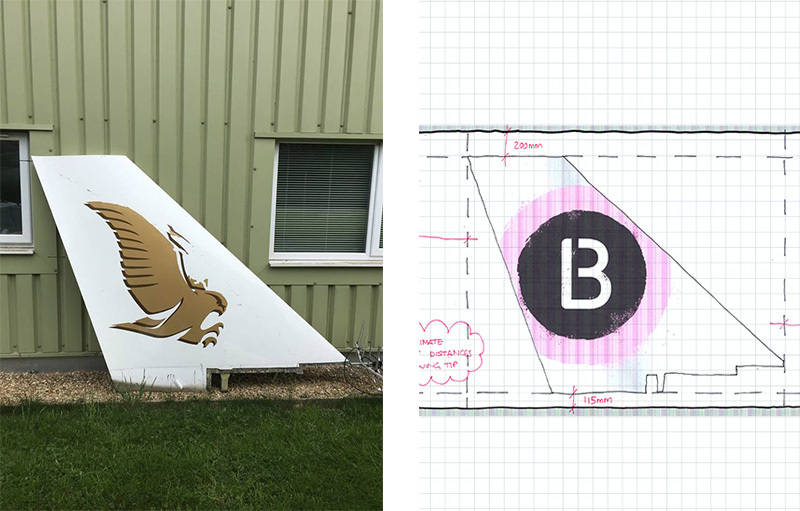 The design also responded to the heightened sense of geographical presence associated with being located within a major transport hub, seeking to celebrate Benugo’s London provenance and brand identity. Through the use of different colour schemes, materials and furniture, the expansive floor area was subtly divided into two distinct spaces. 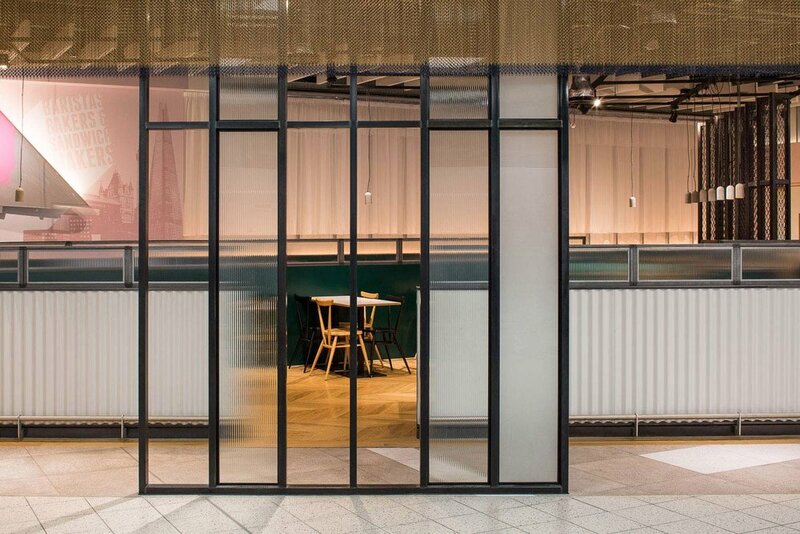 An informal café area featuring playful airport references provides a relaxed environment for families whilst a lounge area, distinguished by a darker material palette, houses a space for quiet rest and respite from the hectic departure lounge. A mobile display table presents a range of cakes and baked goods while the service counter is placed centre-stage, celebrating the performance of the barista. This project involved working closely with London Luton Airport to meet with their approval procedures and guidelines to ensure design quality alongside compliance with technical, safety and security requirements. The making of bespoke wings. On site: Benugo Luton Airport nearly reaching completion.